The ultimate combination of elegance and simplicity, the Amish Arts and Crafts Dining Room Chair is a gorgeous display of woodworking. With comfort built right in to each chair, these are the seats you can rely on for those special moments when you are gathered with family. Everyone has those memories of a wonderful meal surrounded by loved ones. Select the furniture that enhances that experience with this Amish made mission furniture. Mission style furniture grew out of the Arts and Crafts movement of the 19th century. This was a time when many were ready to move away from the over decorated and fussy styles of the Victorian era. Mission style furniture provided strength, simplicity and a style that was embraced and still stands today as a classic you can count on. Sculpted slat work in the chair back curves gracefully in this Arts and Crafts chair, offering just the right support as you sit. The solid legs and generous seat ensure comfort every time you sit. We also offer a matching Arts & Crafts Bar Stool for your kitchen island or bar area to match these Mission chairs. Customize this mission furniture with your choice of wood and stain. We offer a wide variety of custom fabrics and leathers if you should prefer an upholstered seat. Select side and arm chair styles to complete your dining room furniture collection. This heirloom quality furniture will not have to be replaced. 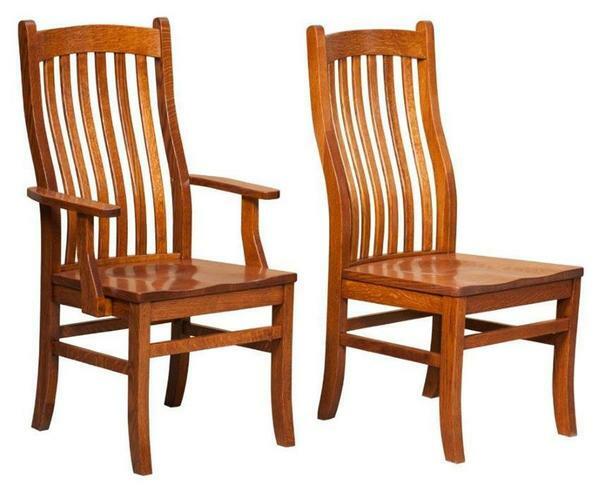 Call today to speak with an Amish Furniture Representative about our solid wood dining chairs. You can reach us at 866-272-6773 or at our brick and mortar store in Sarasota, Florida. Just wanted to let you know we received the chairs today — and they are beautiful. I’m very happy with the quality and service from DutchCrafters. We have our table, it is set up and working well. We have had it filled with loving family for three events and all is well. Thanks so much for your help over the past months. Please pass on our thanks to Jennifer.